From Thanksgiving Day through Imani (Jan. 1, the last day of Kwanzaa) is the season of giving thanks. And even during this rough - and it is very rough - economic time, there is still plenty to give thanks for. I am most grateful for just being, as I like to say, "living and breathing." There are so many people who didn't live to see this holiday season. Some died naturally. Too many met their end because of gun, street and/or domestic violence. Still others took their own lives, unable to cope with the pressures this society placed on them (or that they placed on themselves). I have been blessed with relatively good health. Last Friday I attended the annual Seniors on the Move Christmas party and was pleased to see so many of them in attendance, laughing, dancing and having a good time. To me, there is nothing more inspirational than to see our elders enjoying life. Theirs are the footsteps I want to walk in as I, too, traverse the road to getting old. I am grateful for my children. They both have turned out to be fine adults. I am especially grateful that my son is beginning to reflect all of the hard work I put into raising him. He has strayed off the right path a few times, but has always veered back onto it. He is also demonstrating that all those lectures I put him through, when he didn't want to listen, did pay off. I highly recommend that parents drive their children to the places they want to go. It's the best time in the world to give them those lectures, plus they can't so easily avoid listening when you're in the car together. As my son recognized that car time was talk time, he began to prefer catching the bus rather than having to listen to me. That didn't hurt my feelings because it caused him to grow up and eliminated me from the role of chauffeur. I am grateful for this newspaper. I always pick up free community newspapers all over the city and this small paper with limited resources does a fantastic job of keeping this community informed. I am not an employee but rather a freelance journalist for it. However, even I am amazed at how many times this paper puts together so many different sources into a comprehensive and fluid piece of journalism, rivaling what the daily newspapers put out. I am grateful for the Austin community. I've lived here for 20 years, and this community has some of the best people in the world living and working here. As a community, we still need to do better when it comes to our main thoroughfares. There is still too much littering, especially near the bus stop by Save-A-Lot at North and Central avenues. Our redevelopment of a viable black-owned commercial district is processing slowly but steadily. It is a pleasure to hear that the 5800 block of West Chicago Avenue is still going ahead and working on becoming a stronger commercial hub, with a planned mural celebrating our heritage along with several new businesses that will be relocating there. I'm grateful to a number of friends who have been my biggest supporters when it comes to my book, Billion Dollar Winner. I recently had the opportunity to present a copy to Rev. Jesse Jackson and got invited to promote the book at Rainbow PUSH. 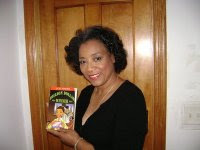 I have also gotten a four-star review on Amazon.com by a professional reviewer for Apooobooks.com, the largest Web site for African-American literature on the Internet. I have gotten tremendous support for the book from elected officials, including Cong. Danny K. Davis, state Rep. La Shawn Ford and Ald. Ed Smith. I am especially grateful to Garfield Majors. For the past few months, I've been a guest on his radio show (1450 AM on Sundays, 10 p.m. to Midnight) to talk about any and all issues. Mr. Majors has, for over 20 years, been providing information to our side of town when others have overlooked us. From the current horrific problems at the Juvenile Detention Center to learning last week that the deacons at Greater Whitestone Church, 3819 W. Ogden, changed the locks on the door and locked both the parishioners and pastor out of the church, his show is a vital source of news and information. If you've never listened and heard Majors, Rev. Bowers and Cong. Davis when they quote scripture as a retort to something the other has said, then you've missed a treat. The three of them are such biblical scholars, they can "play the dozens," using scriptural teachings without having to denigrate themselves or stoop to the low level of behavior that so often characterizes black men. The love, respect and honor they have for each other and the black community represents what we still have. In addition, if you want to hear some powerful preaching at least once in your life, you have only to listen to Rev. Bowers to be taken back to the time when he was the standard for black preachers, as opposed to some of the jack-legged ministers we have nowadays who impersonate being pastors when they are little more than devils incarnate. Lastly, I am grateful to you, my readers. Whether it's out in public and you tell me about remembering a column I wrote or you send me an e-mail about one I wrote years ago (I'm still getting e-mails about the red light cameras), you are the reason I write.